Isometrics are the secret to totally transforming your body! Okay, I’ll tone down my enthusiasm for a bit and explain. Isometrics is a series of static (or at an advanced level “dynamic”) contractions that stimulate the development of lean muscle tissue. This means you burn more calories, blow-torch fat, build a firm, athletic physique and develop incredible strength. I cover this in detail in my complete 7 Week Training Guide – 7 Seconds to A Perfect Body, The Scientifically Proven Method for Transforming Your Body in Just Seconds! Over 250 pages and filled with more than 100 photos it will transform your body from your face down to your toes, sculpting your physique and letting you develop astonishing strength with just seconds of exercise. With Isometrics you can use the body’s own resistance or you can use external tools such as towels, door frames, weights and more. Bruce Lee even went as far as to build his own specialised machines! In the photo on the left you can see the results of this as Bruce Lee contracts the Latsisimus Dorsi - a large pair of muscles on the back. 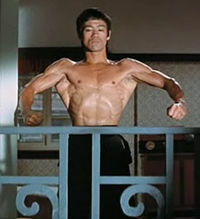 This scene from Way of the Dragon clearly shows Bruce's incredible physical development. Iso-Execises - Sculpt YOUR body without weights! Ios Contraction - How Your Body Builds Muscle, Burns Fat and more in Just 7 Seconds! The Benefits - Aside form Being the Most Efficient, Productive Workout Possible What Else can it do? The Disadvantages - Well after all that what can’t it do? Iso Seniors Exercise - Can Movement-less Exercise Really be the Key to Increased Everyday Activity? Iso Chest Exercises - In just a few minutes from now your chest is going to be stronger, more toned, and you’ll have more energy coursing through your whole body! On this site, you’ll find many examples of Isometric Training and how you can use it to get in great physical shape, fast track the fat off your body and have near inexhaustible energy levels! If you want to be stronger, faster, leaner and firmer and possess animal-like flexibility and dynamic movement, then you want to practice Isometrics. The best advice I can give you is to exercise a little mental muscle first. Read this website thoroughly – this is the largest website in the world on Isometrics. The articles here will guide you to greater strength gains and a better body than you ever thought possible. Sign up for 7 Seconds to Strength - the Isometric E-Zine because it contains great recipes, articles, exercise tips and tricks, delivered to your inbox once or twice a month. Invest in yourself and your health by working with me one-on-one. I can coach and train you online for far less than a single, in-person session. You get all the motivational encouragement and the little known secrets that I have used to transform the lives and bodies of thousands. If you’d like to know more, just click here. Pick up a copy of my No.1 Ranked training guide – 7 Seconds to A Perfect Body, The Scientifically Proven Method for Transforming Your Body in Just Seconds! Over 250 pages and filled with more than 100 photos it will transform your body from your face down to your toes, sculpting your physique and letting you develop astonishing strength with just seconds of exercise. This gets my highest recommendation. It goes into overdrive as it explains everything you need to know to develop super strength, terrific muscle-tone, maximal muscle growth and blowtorch body fat, all at the same time! It’s also phenomenal value so you have no reason not to buy it! You want more muscle? You want to lose weight? You want simply to tone up? You want to be stronger? Faster? More flexible? Possessed of near limitless energy? Isometrics is the path that will take you there – so start moving. Your journey begins here! You've been reading about Isometrics. Check out some Isometric Ab Exercises here.